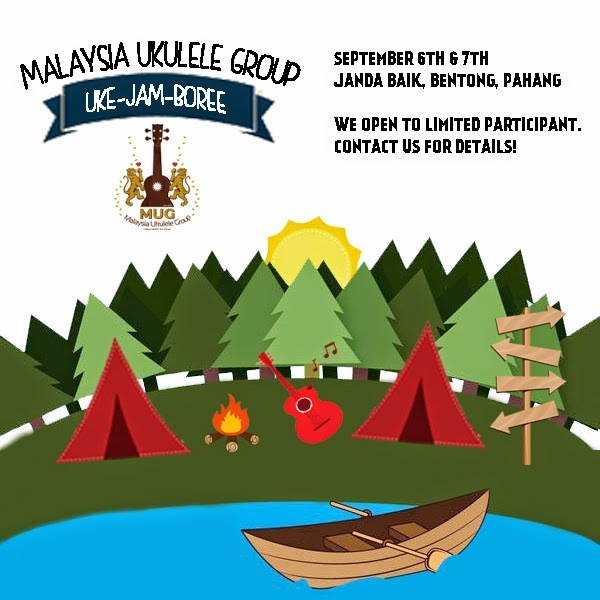 we are planning to do uke-jam-boree in SEPTEMBER! in Janda Baik. MUG will rent a guesthouse there. we gonna do workshops / ukejams / BBQ / outdoor activities / swimming / get close with nature / laugh and laugh and have fun! if you have questions & suggestions, let us know. its good for you to bring a long your family too! family weekend gateway. cool isn't it? yeay! but, do know that its LIMITED to numbers of 40 people. so, let us know that you are coming alright! *Workshop 2 will be open to anyone who want to share any knowledge about music - ukes, flute, drum and anything related. 2. Mr. & Mrs. Shahril and kids. So far 14 adults and 5 kids. THIS WILL BE FIRST COME FIRST SERVE BASIS. ONCE YOU PAY, THEN WE WILL ADD IN YOUR NAME TO BOOK THE CHALET. **WE GIVES PRIORITIES FOR FAMILY WITH KIDS AND SINGLE LADIES. KASI CHANCE LA OK. hhehehe. + there are 7 showers on the compound or you can also enjoy the rivers ! - Frisbees / Boomerang / Badminton / you name it all! Kalei Gamiao LIVE in KL! First time I saw him perform live on stage was on last year at TIUF (Thai International Ukulele Festival) in Bangkok. Humble, Skillful and Entertaining! These three words enough to elaborate about this guy! And now he will be coming over to perform live in Kuala Lumpur on his Ukulele Redefine Asia Tour. Concert will be held on 21st June 2014 at Matic@KL of Jalan Ampang, Kuala Lumpur. 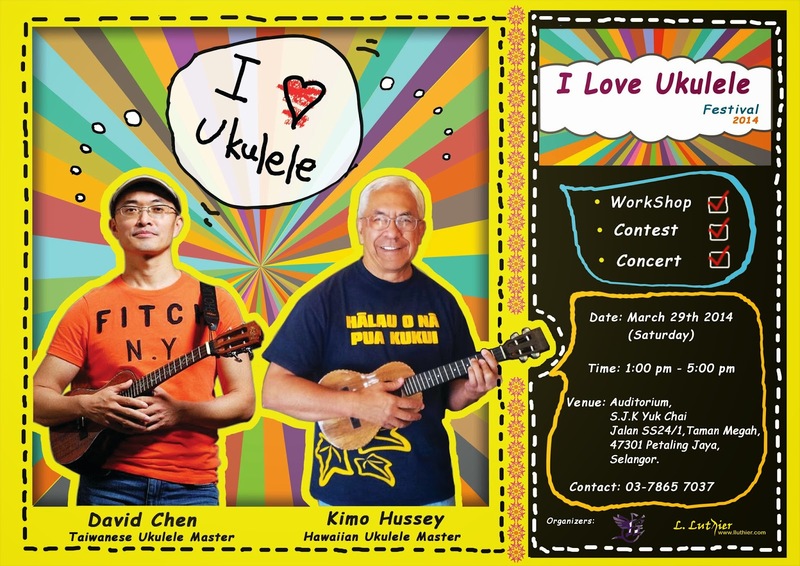 Prior concert, there will have ukulele workshop session conducted by himself. This a great chance for everyone to see and learn ukulele techniques from him. You may not able to get this chance come again! Don't miss it! Guarantee no regret! Everyone who played the ukulele should come to the event. Concert event is fully organized by Ukulele Malaya, any ticket purchase can get through online purchase by clicking HERE or come to Ukulele Malaya showroom to purchase pass entry. Get your pass with affordable price including workshop & performance by Kalei Gamiao from Ukulele Malaya! Az Samad and W.I.L.U will be the guest performer for the opening act. Az was one of the great local musician that we ever see. Also very humble and skillful, but the most I like about him is on his music itself, all his melodies very soulful. So let's come to support our local ukulele musician too. Ukulele/Guitarist-Composer-Educator Az Samad has recorded with Grammy Winners Flaco Jiménez & Max Baca; graduated & taught at the prestigious Berklee College of Music; performed in the United States, Europe & Asia; and appeared on 21 CDs ranging in styles from Tex-Mex, Contemporary Jazz to solo acoustic guitar. His works have been described as “richly textured, poetic and atmospheric”. Previously based in Berkeley, California; Az now lives in Kuala Lumpur. It's been a while we're not updating this page. However after a year, we will go back to the PPUM again for the above festival to cheer up all the kids there.. MUG will do a performance, so if anyone out there interested to join us please do accept below event in FB. If you want to see the previous festival which held on 2012, Go click here. So we hope we can more participants to support this event. Uke-nited As One! 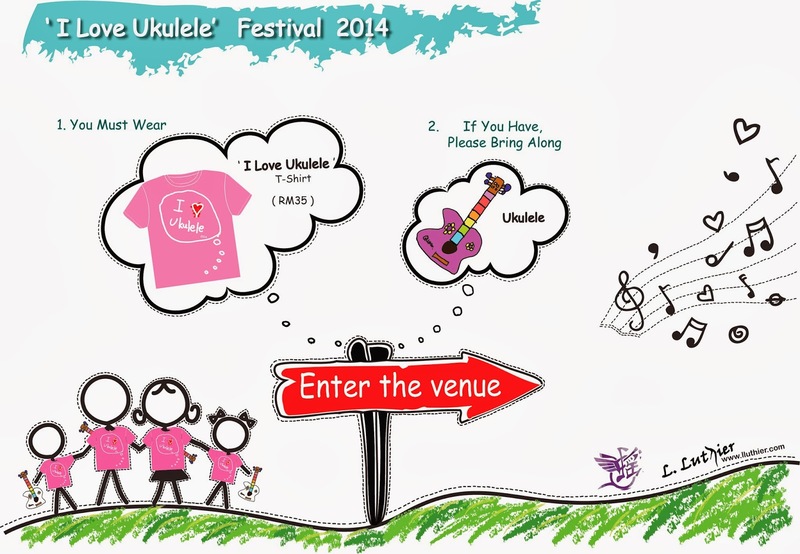 We would like to invite you guys to come over to "I LOVE UKULELE FESTIVAL 2014" organised by L.Luthier. There will be ukulele concert, contest and workshop - in one day. how great is that? as you can see, our ukulele master is back! Kimo Hussey and David Chen. if you guys missed last workshop done by them, you shouldn't missed this one. seriously! its worth it! regarding on ukulele contest, its open to everyone who are interested in showing off their talents, do note that contestants and audiences both pay the same entry of RM35, and will get a free T-Shirt that will be like your ticket to the entire event. Contest entries will close on March 3rd, so do take note. Prizes up for grabs are our island series ukuleles. save the date : MARCH 29th, 2014. bring along your friends and family. not forgetting your ukulele! it will be lots of uke-fun! and hope to see you guys there! Aloha strumers!! As mentioned in FB before, on this coming Saturday, 22/2/2014. MUG has partnered with Sendikit Sol-Jah to organize ukulele mini concert and poetry readings at Rumah Pena, KL. Event will be start on 8.00pm until finish. Ukulele Malaya also will be there to open booth for selling their products. For fans of Nasi Kuning (Nasi Lemak Utara), Zira's Kitchen also will be there. Don't be surprise the price is very super cheap! Malaysia Ukulele Club (PPM-008-14-13042012). Powered by Blogger.